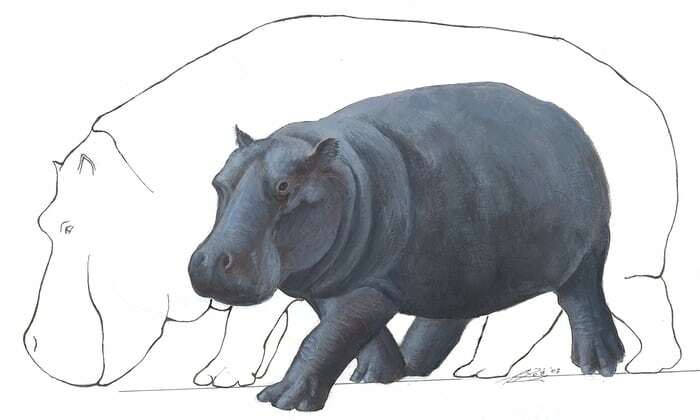 The Maltese dwarf hippopotamus (Hippopotamus melitensis) is an extinct species of hippopotamus or pigmy hippo, remains of which have been found on Malta. It first arrived after the Messinian salinity crisis. The Messinian salinity crisis was a geological event during which the Mediterranean Sea went into a cycle of partly or nearly complete desiccation and dessertification. It ended with the Zanclean Deluge, a flood that ensued when the Strait of Gibraltar opened and that must have refilled the Mediterranean Basin some 5.33 million years ago when water from the Atlantic Ocean again reclaimed the basin. The absence of predators combined with a scarcity of food led to the dwarfing of the hippos. The majority of findings of this species on Malta are from Għar Dalam, a cave on Gozo famous for its Pleistocene fossil deposits. They stood just 80 centimeters high. The Maltese dwarf hippopotamus lived during the Pleistocene, better known as the Last Ice Age that ended around 11,700 years ago. Some think that dwarf hippopotamuses from Malta, Crete (Hippopotamus creutzburgi), Cyprus (Hippopotamus minor) and Sicily (Hippopotamus pentlandi) all belonged to the same species. The name Hippopotamus pentlandi has since then regularly used for the four species. However, the Sicilian species is somewhat larger than the species from Malta, but still smaller than the living species (Hippopotamus amphibius). The Cyprus dwarf hippopotamus survived until the end of the Pleistocene or early Holocene. Evidence from an archaeological site at Aetokremnos continues to cause debate on whether or not the species was encountered by man.